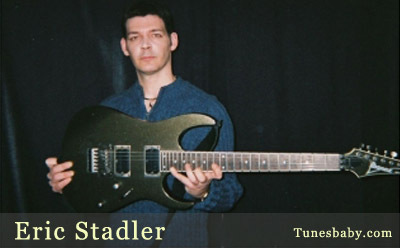 Eric Stadler was first introduced to the world of music while still in the womb when his mother used headphones to expose her unborn child to classical masterpieces such as those by the likes of Beethoven, Resphighi, and Mozart. Even as a very young child, Eric greatly appreciated advanced forms of music, opting for more elaborate musicianship rather than most mainstream forms of music. Eric is as enthralled with melody as he is with technique; creating a subtle yet expressive fusion filled with passion and unique intensity. Having played the St. Louis local scenes in various cover bands, he is well known for his passionate style and technical ability. Eric is currently working on a proffesional progressive guitar instrumental debut cd. Eric uses an Ibanez RG, A Crate GLX212 amplifier, and a BOSS BR-900 cd (digital 8-track recorder). No effects, no pasting, no editing, no mastering. Only disc finalization. **Update** Very excited to announce my upcoming review in Guitar Player Magazine\'s July 2006 edition.